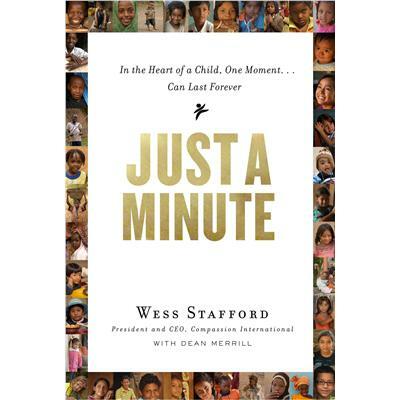 Just a Minute : In the Heart of a Child, One Moment ... Can Last Forever was sent to me by Moody Publishers. 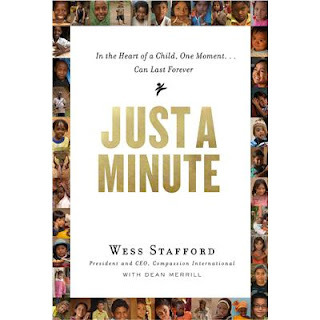 This book is written by the President and CEO of Compassion International, Wess Stafford. The book is made up of a string of short stories which all give an example of how giving "just a minute" of time to a child can be hugely influential in their little lives. Stafford has traveled the globe and in this book he shares stories that he has heard at Compassion International events, as well as personal stories. All combined, the goal is to encourage the reader to take time out of their busy day and schedule to effect positive change in the life of a child. The stories are compassionately short and heart warming, just as you might expect them to be. The whole time I was reading it, I wondered if Stafford was a father who had to spend a consecutive 24-hours of time with his own children, because reading these stories made me feel exhausted as a mother. They really can make you feel a sense of Mommy Guilt if you aren't careful. I started wondering if I was being creative enough and spending enough time investing in my children. But I am and I do and there's no need for me to take on more guilt than I already naturally have in not being able to give each child my undivided attention. Some days go by and I discover I have not said even one brilliant thing to a single one of my kids. I rather felt like Just a Minute had a Chicken Soup for the Soul feel to it. The stories were endearing and they make you feel all warm and fuzzy. I like Compassion International and have no problems with it. (We are sponsors to a little girl in the Dominican Republic.) Stafford's personality which eeked into and out of his writing didn't turn me off in any way. I just found it to be more of a "bathroom reading material" sort of book which didn't impress me with any strong emotions in any direction. It is certainly not a bad book. It's just a fluffy Love a Child sort of affair. Ok, perhaps this is not a glowing recommendation and a way to start out a bloggy week but there 'tis. This book claims to be a set of "68 Stories That Will Inspire You to Bless a Child's Life." Right now I think my children will feel blessed if we play a game of Uno and I make lunch and feed it to them. Some days it's not about being brilliant. It's just about living life together. And that takes more than just a minute. This book was provided to me by Moody Publishers in exchange for my honest opinion. Please do not assume from what I've said that Stafford is devaluing motherhood or parenting in general. He isn't and he doesn't. I just wasn't thoroughly impressed or inspired by the book because motherhood leaves me feeling less than clever some days and a bunch of stories in a row about how great someone's interaction with one child is made me want to stick my tongue out at them. (Because yes, sometimes I really can be that mature.) If there was a book about how you can bless a mother in Just a Minute of your time, I'd probably be way more moved. I would probably have the same reaction to this type of book. One thing that struck me about the Little House books was that Ma didn't seem to get down on the floor and play games with her children. That's not a bad thing to do -- but in that day, a lot of their family time was working together. They had times of relaxation in the evening -- the girls danced while Pa played his fiddle (and Ma sewed....poor Ma!) and they had get-togethers like the dance during the maple sugaring. But they had far less recreational time than we do now. I'm not saying we should go back to that kind of culture and schedule -- but I don't think we need to feel guilty for not coming up with new and creative ways to do things. I understand the point the author is making but you summed up what we should do; "Some days it's not about being brilliant. It's just about living life together. And that takes more than just a minute." I love that! I always tell my sweet savages that we clean the house together because we all live here and cleanliness is an important factor of life. I also like what Barbara H said about not letting a schedule get in the way of family. As mothers we DO have to get stuff done! If I don't who will? And when we are all in a routine of helping each other out and getting things done then we do have time to play! I am also a big fan of those days of throwing everything out the window and going to the zoo for the day. Every once in a while it does the heart and soul good to rebel. I love Compassion and their work with and for children in poverty. They are changing lives one child at a time! We sponsor 4 kids (one for each of our own) in Uganda. It would be amazing to travel their and meet them. "The whole time I was reading it, I wondered if Stafford was a father who had to spend a consecutive 24-hours of time with his own children, because reading these stories made me feel exhausted as a mother." Ha, ha, boy can I ever relate to that!! This: "Some days it's not about being brilliant. It's just about living life together." Is brilliant. hahaha! I'll probably skip it, but so glad you are sponsoring! I am too. A girl from Ecuador. This one sounds different than what I was expecting. I think I'll skip it. I really don't want more guilt in parenting. You know I plan crazy stuff to do with my kids, but we also just spend time doing housework, yardwork, and just being together. I guarantee you my parenting looks completely different than the standard narrative - because the kids and I just do what we do our way, the way it works for us.